This disc is the Limited Edition re-issue of Ocarina of Time for the Nintendo GameCube that includes the much talked about “Another Zelda Ura” or ‘Master Quest’. On November 22nd 2002, an update to Nintendo’s Japanese Kaze no Takuto (Zelda Windwaker) website revealed that a special bonus disc was being offered to pre-ordering customers. 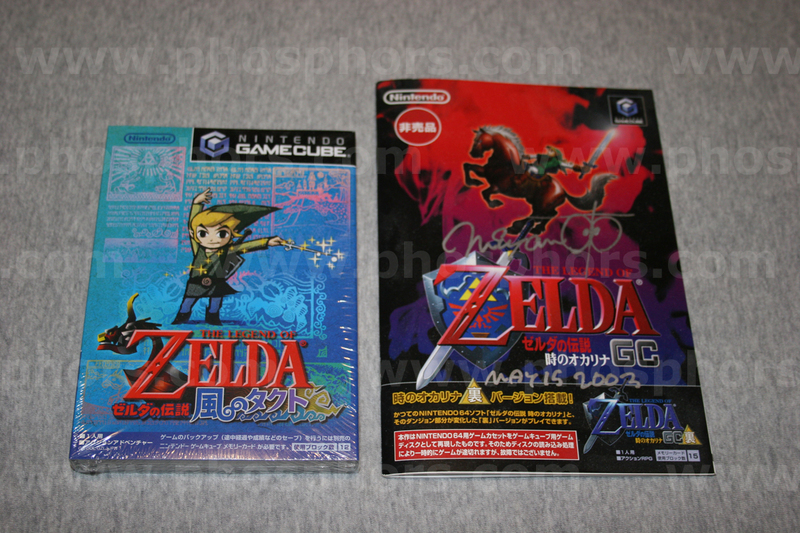 This bonus GameCube game, contained an emulated version of The Legend of Zelda: Ocarina of Time and Ura Zelda, an expansion with modified dungeons and other small changes that never saw a North American release. Ura Zelda (literally, “Another Zelda”) was the Nintendo 64 Disk Drive expansion disk designed for The Legend of Zelda: Ocarina of Time. However, due to the failure of the 64DD as a platform, the game was never released. The game was not truly ported in the technical sense but merely running under emulation, so there were some noticeable inaccuracies in the presentation of both Ocarina of Time and Master Quest as they appeared on the disc. The Disc itself is somewhat hard to find, but apparently this is the first time a sealed copy has been offered in recent memory. PAL B Nintendo NES Stadium Events Boxed – Scandinavian version, which I believe is rarer than the German. Nintendo NES Devil World – PAL Exclusive. Comes with a VHS size official rental box, which I had never heard of before. Nintendo NES Asian Version Boxed System with CIB Small Box Honk Kong Mario – I love how this thing is so much smaller than a regular NES. Nintendo NES World Class Service Center Yellow Control Deck Test Cartridge – Decent starting price, worn label. Sega Mega Drive TMNT TEENAGE MUTANT NINJA TURTLES Return of the Shredder – I love this game. I’ve wanted a CIb copy for some time, but don’t really want to bit the bullet at this price. Nintendo DS IS-Nitro-Emulator Development Kit – Start cranking out games and it becomes an investment. Nintendo Game Boy Bart & The Beanstalk Sealed – This is a definite Gameboy rarity, but no bites at the asking price for a sealed copy. Space Channel 5 Ulala Action Figure from Palisades Toy – In the original packaging from the Wizard World Chicago 2001 Party. It was an exclusive giveaway for the invited guests at that party only at limited to under 300. Is NES Little Smason now worth $500? I hope not. Damaged Merch–Could it be the New Collecting Craze? As far as gameplay I am not sure of any differences. However in Japan this game was given away as with PRE-ORDERS of Wind Waker only. It was not available for sale. Making the print run very low and finding a sealed copy…. Zero Quest – Basically same thing, although my understanding is that the Japanese version is much harder to find. I’m guessing if you use Yahoo Japan or something it would be much easier, but theyre not normally seen on stateside eBay. For example the US versions could fetch 80-100 sealed, while there is currently a loose JAP copy up in that range. Even going back as far as May 2011 I can only find two loose copies which have sold, both for $129.99. I actually have one of these and mine’s still sealed too. I’m in the UK but I’m tempted to list it on Ebay and see what happens. I’ll be sure to inform someone here if I do this.